The prospect of sending email campaigns into international markets may seem daunting, especially if you’re not proficient in your subscribers’ native language. With this guide, and the help of Jaina Mistry at Padawan Group, we want to encourage you to make the most of the opportunity to reach out to a broader audience and provide the tools for you to do so. In the age of technology, there are over 280 million emails being sent daily on a global scale. Since businesses have gone global, so have their subscriber lists and, with target audiences having gone international, email localization segmentation has become vital. Email localization is the adaptation of either a service or product to meet the needs of their international market, which includes adapting to their culture and language. What does email localization mean for marketers? Consider, for example, a US-based business with a focus on fitness clothing for women ages 21-29. In America, many women in this age range have a specific style in mind for their workout clothing: typically minimalistic designs with stylish cutouts. 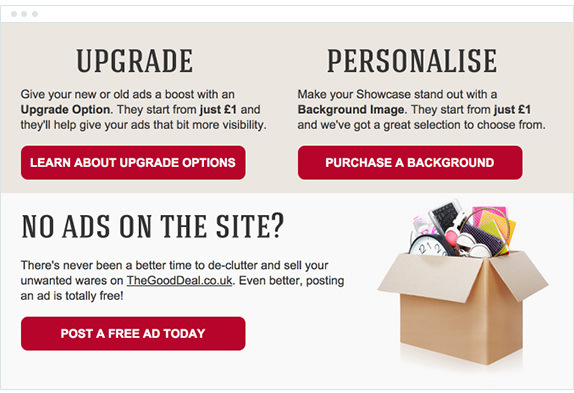 These designs would be ideal for email marketing because they fulfill a desire of their consumer. However, if this brand has a following in a middle eastern region, they would need to pay attention to cultural differences. Many religions in the middle eastern region have a heavy focus on more conservative values, which means that displaying fashions full of cutouts won’t work for this market. Instead, email marketers for our example fitness business would want to focus on displaying fashions with more coverage. Since email marketing is still an ideal venue for companies to reach their consumers, why is it that only 19.36% of retail emails are opened? This is due to the fact that only about 25% of companies keep in mind the regional preferences of their customers during the marketing process, which means that they’re likely focusing on simply pumping out information, without giving much thought to where the information is going. While English is still considered one of the most popular languages online, as of December 2017, this only represented about 25% of worldwide internet users, meaning that another 75% of worldwide internet users don’t speak native English. When it comes down to making their way through the purchasing funnel, 55% of customers prefer to make their purchasing decision if the product or service description is in their native language. There are both human and technical solutions for helping you send error-free campaigns. Drawing from experiences designing and sending email campaigns adapted for English, French, Italian, Spanish, Chinese speakers (and more), we’ll be exploring both the benefits and challenges of sending localized email marketing campaigns, as well as tried-and-tested approaches to ensuring their success. As an email marketer, the first thing on your mind is likely ROI. With retail case studies showing a distinct uptick in conversions and a study by the Localization Industry Standards Association (LISA) reporting that $25 were returned for every $1 invested in localization, the benefits of sending campaigns in your subscribers’ language are very clear. However, while the statistics above may be incentive enough to launch a marketing campaign across multiple languages, it is worth considering other motivations too. Focusing on internationalization is not dissimilar from designing your campaigns for accessibility. If you value making your product or service available to people who communicate in Dutch, Swedish, Urdu, or Mandarin, for example, then making your marketing campaigns—amongst other resources —available in these languages should be a priority. The translation of each email campaign is unique in its own way, but there are similar challenges, techniques, and considerations to keep in mind. Before you start sending spreadsheets to a friend or translator, take note. One of the biggest challenges that come with sending campaigns across multiple languages and cultures is having an understanding of your audience and adjusting your content accordingly. Along with the wording or content, the tone and theme of your campaign will likely need slight adjustments from one region to the next. “Will they get it?” should be a common question as you begin your planning and collaboration with language specialists. For an example of a company that understands cultural differences well, examine Coca-Cola’s regional marketing. With partnerships across 90 developing markets, they are masters at tailoring their messaging and visual style to feature local languages, people, clothing, events, and themes, all while pitching the same product. With that in mind, take a look at some of the other considerations that come with the territory. If you have already segmented your email subscriber list by language, or have separate lists, well done. If not, you can survey your customers—even by simply using a subscriber preference center—to ensure you have accurate data before you send. If you know that your email list will reach an international audience but aren’t yet in a position to target subscribers by language, you can also display all your language versions in a single campaign. This will be discussed in further detail in the “Managing the localization process” section of this guide. Getting the subject line the right length is a basic necessity in email marketing. Fifty characters or less is the best practice for the sake of displaying without truncation in most email clients, which is quite a low number for English. Internationalization increases the difficulty still, with literal translations from English to Italian, for example, requiring far more characters to express the very same concept. The same can happen with preheaders, in which anything longer than about 22 characters won’t fit entirely in the email preview pane or inbox. As a result, you may want to consider using different subject lines and preheaders for campaigns sent in different languages. A localization specialist will be able to help you choose a subject line that’s appropriate to your audience while still remaining concise. Also worth noting is that some countries require subject lines to be prefixed to abide by their anti-spam laws. We’ll cover this in more detail in the “Understanding the law and best practices” section of this guide. From a design perspective, it’s also worth thinking about your call to action. If you use buttons or images, getting this right can pose a problem, with even the simplest 3-word call to action in English blowing out fixed width elements or spanning multiple lines when translated. Not only are there often more words required, but the words can be significantly longer. As is the case with responsive email newsletters, often the most sensible approach is to use a one-column email layout, to best compensate for variable content widths. Using culturally-appropriate images, icons, and diagrams are important in getting your message across as desired. A misunderstanding in this area may generate mild confusion and even result in grave offense. Different regions can have different interpretations of what’s appropriate when depicting people. While you may be comfortable with artwork featuring a mix of genders and races, it’s worth considering the cultural norms of your subscribers. The safe option is to steer towards imagery that’s more symbol-based and less people-based, keeping in mind that metaphoric images or visual gags may not translate well. Being flexible and having a rigid sign-off process with localization experts and translators can help in choosing the correct type of imagery for your email campaigns. A common question amongst email designers and coders is which character encoding to use for HTML email documents. Generally, we recommend using UTF-8 where possible, as this is what is used when sending from Campaign Monitor and is the default encoding for many email clients. For text that includes special characters, you may want to consider a service like Email on Acid’s “Special Character Conversion” to convert these characters into HTML entities. Much of the research around optimum time and day to send isn’t applicable worldwide. The typical workday in Spain is different from other European countries and places like Australia, so you may have to change your ideas around when is the best time to send. Your best bet is to get advice from someone in the target audience’s region to ensure you’re not sending during Friday drinks, prayer time, siesta, or a similar observance when people are less likely to be checking their email. While abiding by your email marketing service’s anti-spam policy or permission policy will usually be sufficient to keep you out of any legal trouble, it does pay to be mindful of regional differences in electronic messaging and marketing laws. Upon gaining permission to email your subscribers, be sure that you provide a means of unsubscribing and your contact details (including a phone number) on your email. In some places, it’s also important to prefix your subject line or ensure that unsubscribe requests are honored within a set number of days. We’ve listed links here where you can find out more about country-by-country laws. When in doubt, we recommend contacting your email marketing service or seeking advice from a marketing professional in your country of interest. The CAN-SPAM Act provides guidelines on sending into the US, from US servers. CASL provides strict directions on gaining opt-in consent to email subscribers. Over the past five years, the European Union has been busy working on creating new legislation to help better protect their citizens from data breaches and give them better control over how their private information was collected and used by businesses. The General Data Protection Regulation (GDPR) is a joint proposal created by the European Commission, European Parliament, and the Council of the EU and is now fully enforced as of 2018. Under this proposal, all “companies” (globally) that process an EU citizen’s personal information must follow the regulation set or risk being fined up to 4% of their annual global turnover or $22,487,060.00 (US dollars)—whichever is the larger amount. The “Regulations on Internet Email Services” have some requirements, including that subject lines have a prefixed “AD” (or their character equivalent) and links to external content come with a written guarantee that linked content isn’t malicious. The Spam Act features a clear description of what constitutes “commercial email” and includes provisions such as identifying the correct legal name of the organization or individual sending the email, as well as an Australian Business Number (ABN), where applicable. Any successful localization project requires teamwork and cooperation. You will likely find yourself working closely with a specialist or translator, who will not only help translate copy but provide advice and insight into the cultural nuances of the region in which it will circulate. It’s useful to recruit a local colleague in sales or marketing or someone who understands the product and its customers, as this strategy ensures that the message is not simply a literal translation of the original. For example, marketing phrases and technical jargon often have commonly-used, sometimes “anglicized” equivalents that a translator outside of your industry may not know. With this in mind, consider the following guidelines to help you work effectively on international marketing campaigns. A “brand guidelines” document is one of the most important documents you can create in the lead up to translating an email campaign into multiple languages. This document should incorporate the tone of voice required for the different regions, notes on how messaging should read (e.g., positive, yet professional), and any key phrases or words. For example, you may have a brand slogan that already has a foreign-language equivalent or should remain in English as part of a logomark or other notable element. Documenting the aim of the email campaign, its audience, and objectives, as you would in a design brief, will also bring clarity for all involved in the internationalization project. For ongoing localization projects, it’s beneficial to promote cross-learning between your email marketing team and localization specialists. By giving them an understanding of how important subject lines and preheaders are, why call-to-action buttons need to be concise and informative, and other guidelines, you can help them make more informed decisions on when and how to best translate the copy you have provided. If you’re starting with an English-language email design, for instance, you would typically take the copy from the design and add it to a spreadsheet to be matched to foreign-language equivalents by a translator or similar localization specialist. This tactic can work well in many instances, but this approach does have its downsides. In some languages, like Traditional/Simplified Chinese and Korean, line breaks can have special significance. Japanese and other right-to-left languages may also require changes to the email layout to ensure copy can be displayed (and read) correctly. In cases like these, it is often best to have translators edit the copy directly (via an email template editor, code, or Photoshop for images), to minimize any errors. Using dynamic content, you can even add multiple languages to the same email campaign, which can reduce your build time dramatically. It is vital to keep in mind during testing that not all countries use the same email clients as you may. For example, Foxmail, by the portal Tencent is popular in China, whereas it hardly gets any press outside of the country. However, it has been localized into English. The importance of a documented sign-off process with allowances for multiple rounds of amends cannot be stressed enough. Don’t just assume that translated copy you receive is perfect. You need to make sure it is appropriate for your audience and is consistent with your brand. Many eyes should scrutinize any international campaign before you finally press the send button. Keep in mind that you don’t have to have perfectly segmented lists to start sending localized campaigns. While it’s very important to gather information on your subscribers’ language preferences, during this process, you don’t have to miss out on the benefits of sending email campaigns in your subscribers’ native language. You should always have a clear and understandable unsubscribe link and be mindful of your subject lines. You can change the language of default text (including social sharing links) in our email builder and forward to a friend in the preference center pages using our template tag language. You may want to choose a subject line that has a similar meaning across many languages if you do choose to send a single campaign across multiple markets. This campaign could be improved by linking through to a survey or preference center to capture the recipient’s language preferences. However, as it is, it’s a clever campaign, which clearly makes it known that the campaign is available in 5 different languages. If you do have your subscribers’ language preferences in a custom field like “Language,” you can create segments using these values and display localized content without having to create multiple versions of the same campaign. Using dynamic content in our email builder, for example, it’s easy to create content areas that display a customer’s language preference, then preview and compare the results, all from within your Campaign Monitor account. 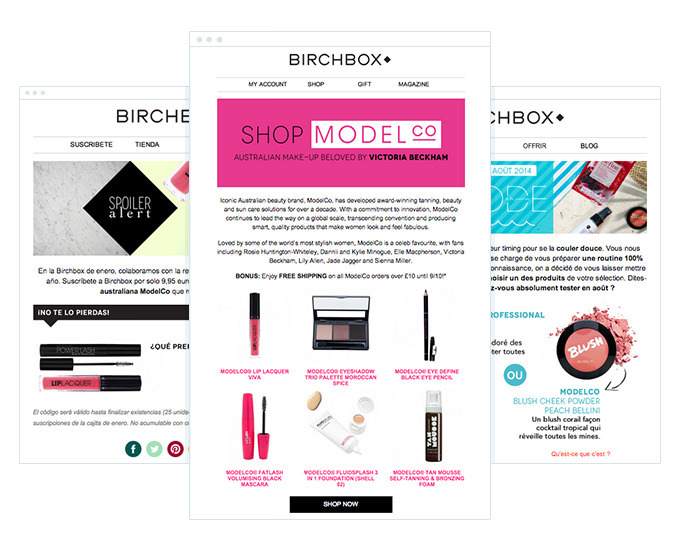 Aside from these approaches, there’s nothing wrong with sending separate campaigns for each language (by list or segment), as Birchbox does at the beginning of the guide, as this allows you to craft the perfect subject line for each of your regional audiences. While it’s often very rewarding to execute on internationalized email marketing campaigns, it should be part of a wider, customer-centric marketing strategy. 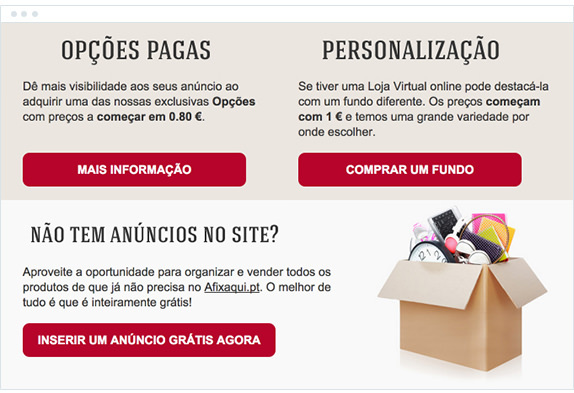 For example, if you’re a Spanish speaker who receives a Spanish-language email newsletter from an e-commerce site but, when you click through, you reach an English-language landing page, that can be a disappointing experience. Designers and marketers who wish to reach new audiences are encouraged to think about the many moving parts in their localization strategy. Are there multiple language options on your site? Can international customers reach product support in their language? Have you created localized eBooks or other content resources for your customers to link through to from the email? By keeping these considerations in mind, and utilizing the right localization partners, email marketers will be able to simplify the creation process of their international email campaigns. This strategy will help increase their open and click-through rates in their international campaigns, resulting not only in a higher ROI for them, but in happier subscribers as well. Happy trails / Buen Viaje! Need help with email localization? Campaign Monitor can help guide you throughout the entire process with detailed list segmentation. Get started for free today!